In the last four days, 170 thousand people attended the second National Fair of Land Reform, in São Paulo (SP), that closed this Sunday (7). According to the Landless Workers' Movement (MST), the event organizer, the event outshined the success of its first edition in 2015, when 150 thousand visitors attended the Fair. Antonia Ivoneide Melo Silva, national director and member of the production sector of MST, considers that the movement improved its visibility even with a smaller dissemination of information from the mainstream press. She commented: "During the last fair we had a large audience and there was diffusion on the press. This year, we had an even larger audience and the big media didn't talk about us. When something was said, it was criticism. And nevertheless, the crowds are here". According to her, besides deconstructing the image that the press creates about the movement, the Fair managed to communicate to the society that the fight for land reform is intrinsically connected to healthy food production. "The movement here is the same that fights for land, because these are not detached, without the land ownership, we can't have a healthy production. The fight for land must join the fight for production and change of the agricultural model", affirms the leader. According to Ivoneide, the event is the materialization of the idea of a popular land reform and of the dialogs of the movement with the population. The visual artist Caroline Harari (58), had her first direct introduction to MST this Sunday (7). For her, the fair demystified the idea that the movement militants are "thugs that invade properties breaking everything". "Many times I saw, through the press, the MST as an distant entity. But today, when I arrived here, I saw that they’re normal people, simple folks fighting for a piece of land and for the right to live", said Caroline. Caroline told that she found "all that a human being can produce in the fair", from in natura products to the more elaborated, like jellies and crafts. Among the public, unusual products, like the craft beer labeled "Fora, Temer" (Get out Temer!) raised attention. Also, according to MST, 280 tons of food were sold. Even with 30 years of experience working with health treatment based on natural products and techniques, Suzane Barreto didn't know MST work on the field. "I wish to know more about the landless, if you could email me something, I'm interested, because I hear good and bad things being said… But I don't have an opinion", said Suzane. She bought 2 kg of chestnut, besides baru, sucupira and genipapo. 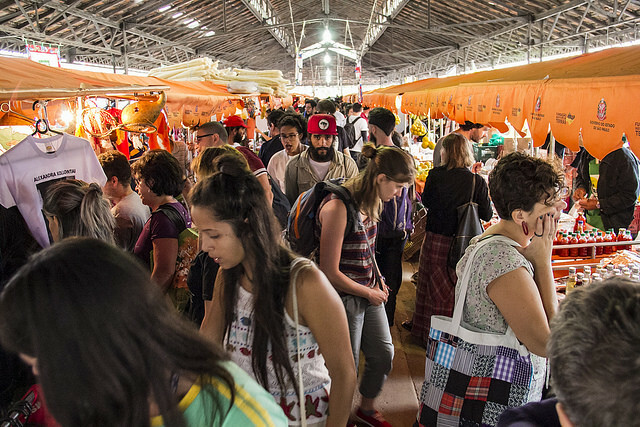 After travelling three days to get to São Paulo (SP), the fair worker Josefa Cristina da Silva, from Mirante da Serra (RO), located 2,7 thousand kilometers from the capital, felt fulfilled about the last day of sales. On the stand of the state of Rondonia the nine different products made of cocoa were a success. Cocoa is the main product from the farms of the settlement Padre Ezequiel. Besides that, pepper and banana also made good sales, affirmed the landless. "Among all products, the chocolate was the most popular in the fair", said the farmer, who is willing to comeback on the next editions of the fair. The collective of production of the settlement Roseli Nunes, in Piraí, south of Rio de Janeiro, sold banana, inhame, corn bread, pepper in preserve, orange and sweets. The vendor Mário Bestetti pointed out the good integration with the visitor of the event. "There is no explanation. You can take it from how voiceless I am, how good it was", he said with an hoarse voice. He affirmed that, even raining in one of the days of the event, the number of visitor during the weekend exceeded the expectations. "It is very important because we bring quality products to the table of Brazilian families". The chemist Jorge Dreyer have attended the first National Fair of Land Reform in 2015. This year, he and her wife visited twice: on the first day, to buy the products, like cheese and salami, and this Sunday, to have lunch on the food court. The plate chosen was the "carreteiro" from the stand of the state of Rio Grande do Sul. For him, the representation of the regional diversity of the country was the most interesting thing. "I think it is important to publicize the culture of other Brazilian states, bringing the products they cultivate". Caroline highlighted besides the diversity, the lower cost of the products. "Unfortunately, here in São Paulo it is too expensive to have a healthy meal with organic products. It is expensive enough to eat with poison. But here we have access to first grade affordable products. If it was a weekly event, I would come". MST is getting ready to the third edition of the National Fair in 2018 and shows interest in using again the facilities of the Água Branca Park in São Paulo.